Traceur is a mobile VR exergame that combines the fun of more traditional 'endless runner' games with the get-up-and-go nature of the Gear VR. Using the accelerometer, Traceur tracks your movements and, once calibrated, will let you navigate an endless runner style gauntlet by jogging, dodging in place, and jumping. 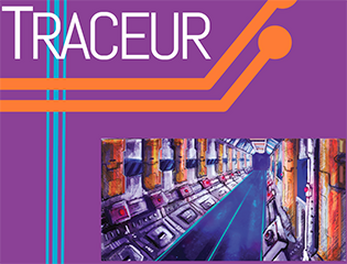 Traceur was developed as a collaboration between students in an advanced Game Design class, and students in a Game Programming class, over the span of two and a half months. It is, as of May 12, still a prototype, and feedback is more than welcome, and actively encouraged. As the game has been developed for the Gear VR, users must follow a set of instructions in order to play Traceur. For now, this process is most easily accessible by GearVR developers. Regular users can still follow these instructions if they wish.